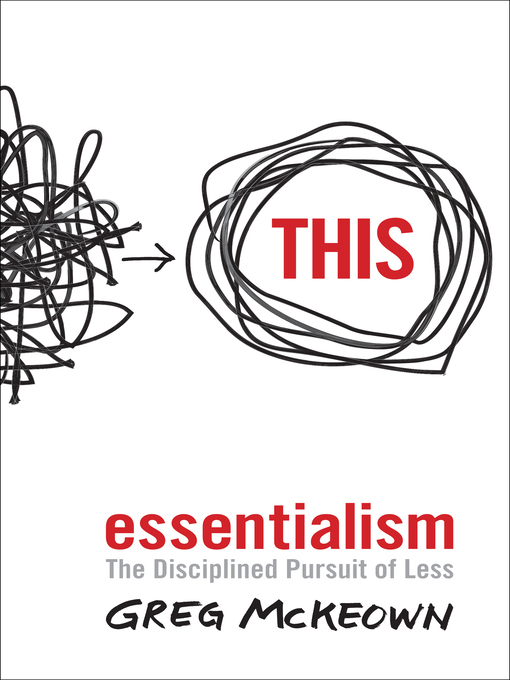 Brimbank Libraries catalogue › Details for: Essentialism The Disciplined Pursuit of Less. Details for: Essentialism The Disciplined Pursuit of Less. Essentialism [electronic resource] : The Disciplined Pursuit of Less. Greg Mckeown. Material type: BookPublisher: 2014Description: 1 online resource.ISBN: 9780753550281 (electronic bk).Subject(s): Nonfiction | Business | ManagementGenre/Form: Electronic books.Online resources: Click to access digital title. | Excerpt Sample | Image Large cover image | Thumbnail Thumbnail cover image Summary: Have you ever found yourself struggling with information overload? Have you ever felt both overworked and underutilised? Do you ever feel busy but not productive? If you answered yes to any of these, the way out is to become an Essentialist. In Essentialism, Greg McKeown, CEO of a Leadership and Strategy agency in Silicon Valley who has run courses at Apple, Google and Facebook, shows you how to achieve what he calls the disciplined pursuit of less. Being an Essentialist is about a disciplined way of thinking. It means challenging the core assumption of 'We can have it all' and 'I have to do everything' and replacing it with the pursuit of 'the right thing, in the right way, at the right time'. By applying a more selective criteria for what is essential, the pursuit of less allows us to regain control of our own choices so we can channel our time, energy and effort into making the highest possible contribution toward the goals and activities that matter. Using the experience and insight of working with the leaders of the most innovative companies and organisations in the world, McKeown shows you how to put Essentialism into practice in your own life, so you too can achieve something great. Have you ever found yourself struggling with information overload? Have you ever felt both overworked and underutilised? Do you ever feel busy but not productive? If you answered yes to any of these, the way out is to become an Essentialist. In Essentialism, Greg McKeown, CEO of a Leadership and Strategy agency in Silicon Valley who has run courses at Apple, Google and Facebook, shows you how to achieve what he calls the disciplined pursuit of less. Being an Essentialist is about a disciplined way of thinking. It means challenging the core assumption of 'We can have it all' and 'I have to do everything' and replacing it with the pursuit of 'the right thing, in the right way, at the right time'. By applying a more selective criteria for what is essential, the pursuit of less allows us to regain control of our own choices so we can channel our time, energy and effort into making the highest possible contribution toward the goals and activities that matter. Using the experience and insight of working with the leaders of the most innovative companies and organisations in the world, McKeown shows you how to put Essentialism into practice in your own life, so you too can achieve something great. Chapter 1 The Essentialist The wisdom of life consists in the elimination of non-essentials. --Lin Yutang Sam Elliot1 is a capable executive in Silicon Valley who found himself stretched too thin after his company was acquired by a larger, bureaucratic business. 1 Name has been changed. He was in earnest about being a good citizen in his new role so he said yes to many requests without really thinking about it. But as a result he would spend the whole day rushing from one meeting and conference call to another trying to please everyone and get it all done. His stress went up as the quality of his work went down. It was like he was majoring in minor activities and as a result, his work became unsatisfying for him and frustrating for the people he was trying so hard to please. In the midst of his frustration the company came to him and offered him an early retirement package. But he was in his early 50s and had no interest in completely retiring. He thought briefly about starting a consulting company doing what he was already doing. He even thought of selling his services back to his employer as a consultant. But none of these options seemed that appealing. So he went to speak with a mentor who gave him surprising advice: "Stay, but do what you would as a consultant and nothing else. And don't tell anyone." In other words, his mentor was advising him to do only those things that he deemed essential--and ignore everything else that was asked of him. The executive followed the advice! He made a daily commitment towards cutting out the red tape. He began saying no. He was tentative at first. He would evaluate requests based on the timid criteria, "Can I actually fulfill this request, given the time and resources I have?" If the answer was no then he would refuse the request. He was pleasantly surprised to find that while people would at first look a little disappointed, they seemed to respect his honesty. Encouraged by his small wins he pushed back a bit more. Now when a request would come in he would pause and evaluate the request against a tougher criteria: "Is this the very most important thing I should be doing with my time and resources right now?" If he couldn't answer a definitive yes, then he would refuse the request. And once again to his delight, while his colleagues might initially seem disappointed, they soon began respecting him more for his refusal, not less. Emboldened, he began to apply this selective criteria to everything, not just direct requests. In his past life he would always volunteer for presentations or assignments that came up last minute; now he found a way to not sign up for them. He used to be one of the first to jump in on an e‑mail trail, but now he just stepped back and let others jump in. He stopped attending conference calls that he only had a couple of minutes of interest in. He stopped sitting in on the weekly update call because he didn't need the information. He stopped attending meetings on his calendar if he didn't have a direct contribution to make. He explained to me, "Just because I was invited didn't seem a good enough reason to attend." It felt self-indulgent at first. But by being selective he bought himself space, and in that space he found creative freedom. He could concentrate his efforts one project at a time. He could plan thoroughly. He could anticipate roadblocks and start to remove obstacles. Instead of spinning his wheels trying to get everything done, he could get the right things done. His newfound commitment to doing only the things that were truly important--and eliminating everything else--restored the quality of his work. Instead of making just a millimeter of progress in a million directions he began to generate tremendous momentum towards accomplishing the things that were truly vital. He continued this for several months. He immediately found that he not only got more of his day back at work, in the evenings he got even more time back at home. He said, "I got back my family life! I can go home at a decent time." Now instead of being a slave to his phone he shuts it down. He goes to the gym. He goes out to eat with his wife. To his great surprise, there were no negative repercussions to his experiment. His manager didn't chastise him. His colleagues didn't resent him. Quite the opposite; because he was left only with projects that were meaningful to him and actually valuable to the company, they began to respect and value his work more than ever. His work became fulfilling again. His performance ratings went up. He ended up with one of the largest bonuses of his career! In this example is the basic value proposition of Essentialism: only once you give yourself permission to stop trying to do it all, to stop saying yes to everyone, can make your highest contribution towards the things that really matter. What about you? How many times have you reacted to a request by saying yes without really thinking about it? How many times have you resented committing to do something and wondered, "Why did I sign up for this?" How often do you say yes simply to please? Or to avoid trouble? Or because "yes" had just become your default response? Now let me ask you this: Have you ever found yourself stretched too thin? Have you ever felt both overworked and underutilized? Have you ever found yourself majoring in minor activities? Do you ever feel busy but not productive? Like you're always in motion, but never getting anywhere? If you answered yes to any of these, the way out is the way of the Essentialist. The Way of the Essentialist Dieter Rams was the lead designer at Braun for many years. He is driven by the idea that almost everything is noise. He believes very few things are essential. His job is to filter through that noise until he gets to the essence. For example, as a young twenty-four-year-old at the company he was asked to collaborate on a record player. The norm at the time was to cover the turntable in a solid wooden lid or even to incorporate the player into a piece of living room furniture. Instead, he and his team removed the clutter and designed a player with a clear plastic cover on the top and nothing more. It was the first time such a design had been used, and it was so revolutionary people worried it might bankrupt the company because nobody would buy it. It took courage, as it always does, to eliminate the nonessential. By the sixties this aesthetic started to gain traction. In time it became the design every other record player followed. Dieter's design criteria can be summarized by a characteristically succinct principle, captured in just three German words: Weniger aber besser. The English translation is: Less but better. A more fitting definition of Essentialism would be hard to come by. The way of the Essentialist is the relentless pursuit of less but better. It doesn't mean occasionally giving a nod to the principle. It means pursuing it in a disciplined way. The way of the Essentialist isn't about setting New Year's resolutions to say "no" more, or about pruning your in-box, or about mastering some new strategy in time management. It is about pausing constantly to ask, "Am I investing in the right activities?" There are far more activities and opportunities in in the world than we have time and resources to invest in. And although many of them may be good, or even very good, the fact is that most are trivial and few are vital. The way of the Essentialist involves learning to tell the difference--learning to filter through all those options and selecting only those that are truly essential. Essentialism is not about how to get more things done; it's about how to get the right things done. It doesn't mean just doing less for the sake of less either. It is about making the wisest possible investment of your time and energy in order to operate at our highest point of contribution by doing only what is essential. The difference between the way of the Essentialist and the way of the Nonessentialist can be seen in figure 1 above. In both images the same amount of effort is exerted. In the image on the left, the energy is divided into many different activities. The result is that we have the unfulfilling experience of making a millimeter of progress in a million directions. In the image on the right, the energy is given to fewer activities. The result is that by investing in fewer things we have the satisfying experience of making significant progress in the things that matter most. The way of the Essentialist rejects the idea that we can fit it all in. Instead it requires us to grapple with real trade-offs and make tough decisions. In many cases we can learn to make one-time decisions that make a thousand future decisions so we don't exhaust ourselves asking the same questions again and again. The way of the Essentialist means living by design, not by default. Instead of making choices reactively, the Essentialist deliberately distinguishes the vital few from the trivial many, eliminates the nonessentials, and then removes obstacles so the essential things have clear, smooth passage. In other words, Essentialism is a disciplined, systematic approach for determining where our highest point of contribution lies, then making execution of those things almost effortless. The way of the Essentialist is the path to being in control of our own choices. It is a path to new levels of success and meaning. It is the path on which we enjoy the journey, not just the destination. Despite all these benefits, however, there are too many forces conspiring to keep us from applying the disciplined pursuit of less but better, which may be why so many end up on the misdirected path of the Nonessentialist. The Way of the Nonessentialist On a bright, winter day in California I visited my wife, Anna, in the hospital. Even in the hospital Anna was radiant. But I also knew she was exhausted. It was the day after our precious daughter was born, healthy and happy at 7 pounds, 3 ounces.1 Yet what should have been one of the happiest, most serene days of my life was actually filled with tension. Even as my beautiful new baby lay in my wife's tired arms, I was on the phone and on e‑mail with work, and I was feeling pressure to go to a client meeting. My colleague had written, "Friday between 1-2 would be a bad time to have a baby because I need you to come be at this meeting with X." It was now Friday and though I was pretty certain (or at least I hoped) the e‑mail had been written in jest, I still felt pressure to attend. Instinctively, I knew what to do. It was clearly a time to be there for my wife and newborn child. So when asked whether I planned to attend the meeting, I said with all the conviction I could muster . . . "Yes." To my shame, while my wife lay in the hospital with our hours-old baby, I went to the meeting. Afterward, my colleague said, "The client will respect you for making the decision to be here." But the look on the clients' faces did not evince respect. Instead, they mirrored how I felt. What was I doing there? I had said "yes" simply to please, and in doing so I had hurt my family, my integrity, and even the client relationship. As it turned out, exactly nothing came of the client meeting. But even if it had, surely I would have made a fool's bargain. In trying to keep everyone happy I had sacrificed what mattered most. On reflection I discovered this important lesson: If you don't prioritize your life, someone else will. That experience gave me renewed interest--read, inexhaustible obsession--in understanding why otherwise intelligent people make the choices they make in their personal and professional lives. "Why is it," I wonder, "that we have so much more ability inside of us than we often choose to utilize?" And "How can we make the choices that allow us to tap into more of the potential inside ourselves, and in people everywhere?" My mission to shed light on these questions had already led me to quit law school in England and travel, eventually, to California to do my graduate work at Stanford. It had led me to spend more than two years collaborating on a book, Multipliers: How the Best Leaders Make Everyone Smarter. And it went on to inspire me to start a strategy and leadership company in Silicon Valley, where I now work with some of the most capable people in some of the most interesting companies in the world, helping to set them on the path of the Essentialist. In my work I have seen people all over the world who are consumed and overwhelmed by the pressures all around them. I have coached "successful" people in the quiet pain of trying desperately to do everything, perfectly, now. I have seen people trapped by controlling managers and unaware that they do not "have to" do all the thankless busywork they are asked to do. And I have worked tirelessly to understand why so many bright, smart, capable individuals remain snared in the death grip of the nonessential. What I have found has surprised me. I worked with one particularly driven executive who got into technology at a young age and loved it. He was quickly rewarded for his knowledge and passion with more and more opportunities. Eager to build on his success, he continued to read as much as he could and pursue all he could with gusto and enthusiasm. By the time I met him he was hyperactive, trying to learn it all and do it all. He seemed to find a new obsession every day, sometimes every hour. And in the process, he lost his ability to discern the vital few from the trivial many. Everything was important. As a result he was stretched thinner and thinner. He was making a millimeter of progress in a million directions. He was overworked and under-utilized. That's when I sketched out for him the image on the left of figure 1. He stared at it for the longest time in uncharacteristic silence. Then he said, with more than a hint of emotion, "That is the story of my life!" Then I sketched the image on the right. "What would happen if we could figure out the one thing you could do that would make the highest contribution?" I asked him. He responded sincerely: "That is the question." 1. A version of this story was published in a blog post I wrote for Harvard Business Review called "If You Don't Prioritize Your Life, Someone Else Will," June 28, 2012, http://blogs.hbr.org/2012/06/how-to-say-no-to-a-controlling/. Excerpted from Essentialism: The Disciplined Pursuit of Less by Greg Mckeown All rights reserved by the original copyright owners. Excerpts are provided for display purposes only and may not be reproduced, reprinted or distributed without the written permission of the publisher. McKeown began his mission for a less overcommitted life after he left his wife and hours-old baby in the hospital for an ultimately unproductive client meeting. Punctuated with zippy, thoughtful one-liners, this guide to doing "less but better" offers strategies for determining what is truly necessary, and shedding what is not. Too many people fall for the having-it-all myth, and would benefit from shifting from a non-essentialist mindset (unable to distinguish and parse out the truly important) to an essentialist one (capable of identifying the goal), contends McKeown. Instead of attempting to achieve everything, readers need to figure out how to do the "right thing the right way at the right time." According to the author, the first step is un-committing: resisting the urge to join clubs, take on hobbies, and maintain unsatisfying friendships. Readers can stop making casual commitments, and can get over their fear of missing out. By making better choices, and not taking on the weight of other people's problems, readers can realize the non-essential nature of virtually everything in life, and learn to be present and spend more meaningful time with family and friends. This is a smart, concise guide for the overcommitted and under-satisfied. (Apr.) (c) Copyright PWxyz, LLC. All rights reserved. True to the title, the book boils down its key message to four concepts: essence, explore, eliminate, and execute. McKeown (Multipliers) challenges listeners to evaluate systematically and continually how they spend their time and energy and eliminate all but the most important elements in all aspects of their life. His mantra, "achieve more by doing less," repeats throughout. After all, he says, "If you don't prioritize your life, someone else will." McKeown gives listeners permission to say no to everything that doesn't support their passions in life and work and suggests pausing constantly to ask if one is investing in the right activities. Experiencing this book will change many listeners' lives-for good. McKeown himself narrates; his pacing and his slight British accent make him an excellent choice. The audio version loses some of the print version's delightful illustrations, but the message is still delivered. Verdict Highly recommended for anyone who is overloaded and stressed and looking for some relief.-Gretchen Pruett, New Braunfels P.L., TX (c) Copyright 2014. Library Journals LLC, a wholly owned subsidiary of Media Source, Inc. No redistribution permitted.